Along with the Ather One subscription plan which was announced at the launch of the Ather 340 & 450 electric scooters, the company has now introduced three new subscription plans for customers. The base plan is called Ather Connect. It costs Rs. 3,000 + GST per year and offers over-the-air updates, remote diagnostics, ride recommendations and on-board navigation. Ather Service costs Rs. 6,000 + GST per year and offers vehicle service, roadside assistance in addition to Ather Connect services. 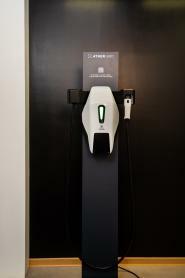 Ather Charge is a charging focused plan that offers home charging and unlimited public charging at AtherGrid points. It also costs Rs. 6,000 + GST per year. Ather One will remain the flagship plan with an annual cost of Rs. 8,400 + GST. All expenses including maintenance costs are covered under this plan. Subscribers get all the benefits of Ather Connect, home charging and public fast charging as well as vehicle service and roadside assistance. Ather One is available to existing customers during the first year of ownership for free. Upon completion of the first year, customers can choose from the aforementioned plans. This offer has been discontinued from October 31, 2018 and those planning to pre-order will get the Ather Service plan for free for a limited period. Further, public charging at AtherGrid will remain free till December 31, 2019 for all Ather customers.